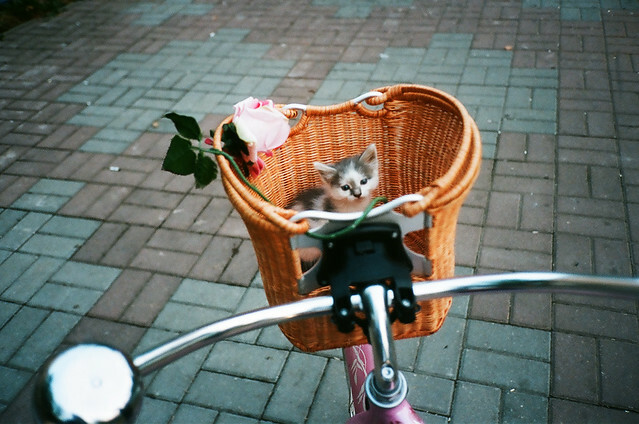 Back in August we blogged about finally, finally getting a shot of a cat in a bicycle basket. Something that was sorely missing from our archives. Marc at Amsterdamize found this shot today, from the Iron Pony First blog, out of Russia. Wonderful shot! They found this kitten and then found a good home for it, transporting it to the place like this. That cat is going to grow up to be so embarrassed by this picture. Why don't grown ups ever consider these things? My cat, my bicycle and myself are all thrilled by this lovely picture!